I work for an international volunteer organization that has numerous volunteer placements in disadvantaged communities, schools and NPO’s in my area. One of our newest placements is with our local animal welfare. I have my first volunteer there for 4 weeks from America. 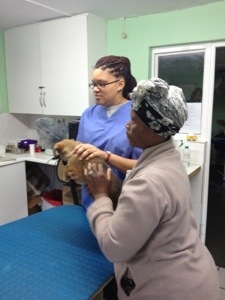 She is studying Veterinary Science with 7 years of studying under her belt already. This has given me a chance to get a glimpse into the world of an animal welfare. I’ve always known how well run and above board our local animal welfare is but I’ve never realized the extent of the sadness they must be faced with daily. Just this morning on dropping my volunteer off I witnessed a man who had brought in his sick 7 month old Greyhound. They will now diagnose her and see what is wrong with her. I hope it’s not serious as the love this man had for his pup was clear to see. 2 minutes after that I spoke to a local chap that I know. He was there to see his pit bull puppy that had been attacked twice in the space of a week by neighbors dogs. Despite a fence around his property other dogs had got to her. He had brought her in yesterday and came in to see her this morning before work. She jumped all over him with excitement but unfortunately she is scared of strangers especially in this strange surroundings. She still bares stitches across a huge scar on her jaw where the other dogs ripped her open and now has fresh wounds to be treated. Poor chap is going to need to speak to his neighbors about making the fence higher and securing his property more as they will undoubtably kill her otherwise. In actual fact these neighboring dogs should be off the streets as they are far too vicious but in poor communities its a lot harder to afford to do home improvements if not possible at all due to lack of funds. Plenty of cats sitting in their cattery either lost or looking for homes. The cattery is great, plenty of soft bedding, scratch posts, fresh food and water and clean litter trays. Not to mention lots of stimulation in the form of climbing apparatus and toys. But there is a lack of volunteers looking to come and spend an hour playing with the cats. They have plenty of volunteers that come into walk the dogs but sadly not for the feline friends. As a lover of cats with 3 of my own I think I must look into volunteering an hour of my time once a week to sit and play with these gorgeous creatures. And talking to my volunteer has been really interesting. Apart from the number of dogs that have been hit by cars that they have needed to treat there is also a total lack of preventative care which comes down to education on caring for your animals.